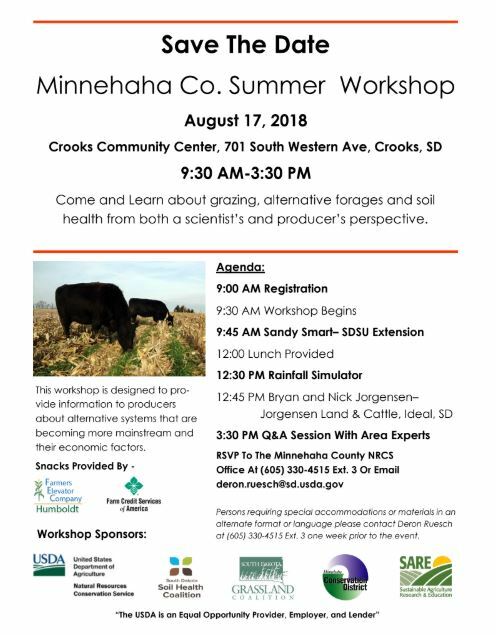 A summer grazing and soil health workshop will be held on Friday August 17, 2018 at the Crooks Community Center, 701 South Western Ave, Crooks, beginning at 9:00 AM. Those interested in learning about sustainable grazing systems, soil health, and alternative forages are encouraged to attend! This workshop is designed to provide information to producers about alternative systems that are becoming more mainstream and discuss the economic factors surrounding them. The day will begin at 9:00 AM with registration and refreshments, and the workshop itself will start at 9:30 AM. Sandy Smart, Professor and South Dakota State University (SDSU) Extension Rangeland Management Specialist, will begin with a presentation on cool season grazing systems and the use of alternative forages. Lunch will then be provided, with a running of the Rainfall Simulator to directly follow. At 12:45 PM Bryan and Nick Jorgensen will begin their presentation on the economics of the grazing and soil health practices they have instituted on their operation. They will describe what led them to change their management and the “aha moment” which also transformed their way of thinking moving forward. Planning and support of this event was provided by the USDA-NRCS, South Dakota Soil Health Coalition (SDSHC), South Dakota Grassland Coalition (SDGC), Minnehaha County Conservation District and the Sustainable Agriculture Research and Education Program (SARE). Please RSVP to the Minnehaha County NRCS office at (605) 330-4515 Ext. 3 or email Deron Ruesch at deron.ruesch@sd.usda.gov.